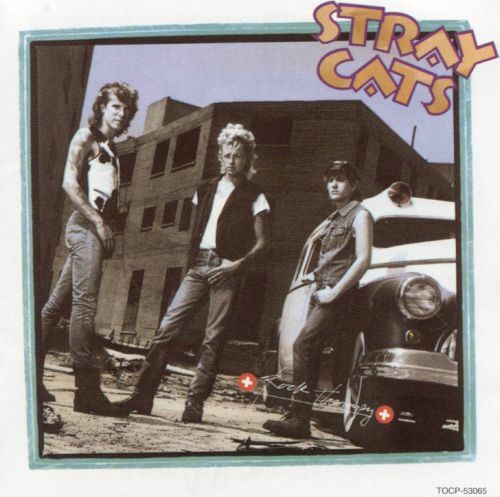 Before Brian Setzer went solo with The Knife Feels Like Justice, one of the most consistently fine rock albums of ’86, and before Slim Jim Phantom and Lee Rocker joined up with guitar ace Earl Slick to produce two albums as Phantom, Rocker & Slick, there was a group called the Stray Cats. With their teen-angel image and stripped-down sound, they rode the wave of the early ’80s rockabilly revival with as much finesse as anyone, and tunes like “Stray Cat Strut” and “Rock This Town” had them sailing up the charts. But the rockabilly craze started dwindling by the end of 1983, and it wasn’t long before the Cats gathered up their fast-made bucks and went their separate ways. So what if they still owed their record company another album’s worth of tunes. They could worry about that later. Well, it’s later now, and the Stray Cats’ final album has just been released. And whether you want to view it as a contractual obligation album or a last goodbye LP, it doesn’t really matter, because it’s one swingin’ disc, let me tell ya. As well as nifty covers of tunes by Chuck Berry (“Beautiful Delilah”) and Buddy Holly (“Looking for Someone to Love”), and a super-cool version of Gene Vincent’s “Race With the Devil”, there’s Setzer’s raging and well-titled “Reckless”, and his country ‘n’ western “Broken Man” that sports some wild banjo and sounds like a good out-take from the Knife Feels Like Justice sessions (and you know that can’t be bad). On the Setzer-Phantom-Slick collaboration “I’m a Rocker”, Brian really burns up the strings, and after hearing it you know why Roy Buchanan calls him one of today’s best players. Whether you’re a Stray Cats lover, a Phantom, Rocker & Slick fan, or a solo Setzer devotee, Rock Therapy is sure to please.